Kennedy Center Names Its 2018 Honorees Cher, Reba McEntire, Wayne Shorter, Philip Glass and the creators of Hamilton will be celebrated at this year's gala on Dec. 2. 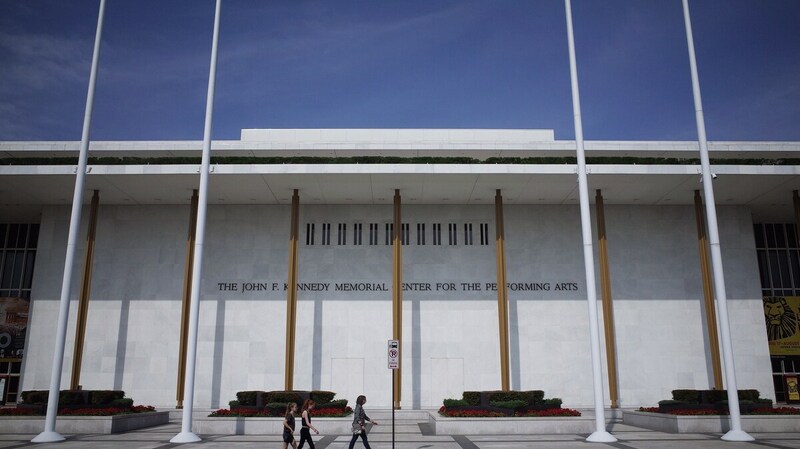 The exterior of the John F. Kennedy Center for the Performing Arts in Washington, D.C. The Kennedy Center annually recognizes artists who have had a uniquely wide and enduring impact on American culture. On Wednesday, the Washington, D.C. institution announced this year's recipients of the Kennedy Center Honors: country singer Reba McEntire, jazz saxophonist and composer Wayne Shorter, composer Philip Glass, singer Cher, and the creative team behind the smash musical Hamilton. This year's awardees are a typically eclectic group of artists. McEntire has forty years of studio history behind her and a sitcom to boot. Along with being a progenitor of jazz fusion and a celebrated Miles Davis collaborator, Shorter is a sci-fi lover who writes comic books. Glass is one of the most celebrated contemporary composers in the world, and is also a co-founder of Tibet House, a cultural institution that seeks to "ensure the survival of Tibetan civilization and culture." Cher is, of course, an idiosyncratic and indelible pop totem (and gifted Twitter user). Her statement upon learning Wednesday's news was typically offbeat: "When I was very young I saw Dumbo and Cinderella and knew then what I wanted to be and the path my life would take and here I am!" The Kennedy Center is also celebrating the four-member team behind Hamilton, one of this decade's most striking artistic phenomenons: writer and actor Lin-Manuel Miranda, director Thomas Kail, choreographer Andy Blankenbuehler and music director Alex Lacamoire. In its announcement, the Kennedy Center calls the musical "a transformative work that defies category." "Historically, the Kennedy Center Honors has celebrated lifetime achievement," says the organization's president, Deborah F. Rutter, in a statement. "In recognizing Hamilton and its co-creators, the Kennedy Center is making an unprecedented statement about an unprecedented work — a work that transcends cultural boundaries and tells America's story in a powerful and contemporary way." Notably, the central artistic vehicle in Hamilton, rapping, is a medium only recently inducted into the Center's honor rolls when, last year, LL Cool J became the first hip-hop artist bestowed a rainbowed medallion by the institution. In 2017, the Kennedy Center also named the rapper Q-Tip, of A Tribe Called Quest, as its first artistic director of hip-hop. Last year, the White House reception that usually accompanies the Kennedy Center awards ceremony was suspended "to allow the honorees to celebrate without any political distraction," White House press secretary Sarah Huckabee Sanders explained at the time. It was only the fourth time in the awards' 40-year history, the New York Times reported, that a sitting president had missed the event — making Trump the first U.S. leader to do so without pressing travel plans or a hostage crisis. Prior to the cancellation of last year's White House reception, three of the five honorees — Norman Lear, Carmen de Lavallade and Lionel Richie — had announced they would not attend, or were considering forgoing, the traditional visit to 1600 Pennsylvania Ave.
Of this year's honorees, three have made their opinion on President Trump plain. Lin-Manuel Miranda said he is "going straight to hell," in response to a tweet President Trump sent about the mayor of San Juan, Puerto Rico. Sarcastically, Philip Glass thanked Trump in a 2017 interview with Austria's Profil, saying, "It's wonderful ... Even my children, who before were only immersed in video games, now attend demonstrations and engage politically. We should be grateful to Trump for shaking us." Cher's all-but-legendary Twitter account is consistent in nothing else if not ire for the president. McEntire has maintained that she does not talk politics — but denied, backstage at this year's Grammy Awards, that her cover of "Back to God" was any pro-Trump signaling after the song was held up by Trump supporters as a signal of her support. Asked about her intentions in recording the 2008 song, and whether they had anything to do with the president, McEntire responded, incredulously: "Are you kidding?" This year's ceremony will take place Sunday, Dec. 2, 2018 and will be broadcast on CBS December 26 at 8 p.m. ET.